The lines running to the kitchen are linked to the faucet and the dishwasher. The water pressure for the kitchen sink was always fine. It's no firehouse but it doesn't need to be. However, in the last couple of months it has decrease to just above a trickle. I've opened up every possible inlet/outlet on the faucet to clear rust and it appears to be fine. I disconnected the flexible supply lines and ran water through those. There doesn't seem to be any obstruction but the pressure there is still lacking, although seemingly not as bad as at the faucet. I don't know where else to look for an obstruction. The faucet itself was/is low-flow but this is ridiculous. The water pressure everywhere else in the house is fine so it has to be isolated to the lines running to the kitchen. I've experienced an episode where I was running the dishwasher and the sink at the same time and caused some 'jackhammering' in the lines. Shutting off the sink stopped the "hammering". I intend on having the galvanized replaced with PEX at some point but it isn't in the budget right now. I'm hoping there is a way to clear the lines for the time being. I am not experienced with plumbing. I've read quite a bit on the web but I don't like working with the galvanized for fear I'm going to make something worse. I'm very close to calling a plumber but I want my ducks in a row if I come to that point so I'm not taken for a ride. Since the pressure drops for both hot and cold at this fixture, the problem is inside the fixture as you've already guessed. The first place to look is any aerator or filter screen on the fixture, debris gathering there will quickly slow the entire flow. 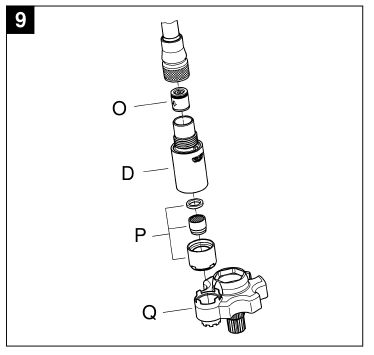 Looking at the diagrams for your faucet, I believe that will be part P (the flow straightener) in this picture (Q appears to be a tool for opening the end of the spray assembly). You can also verify the pressure from before the fixture is strong by disconnecting the hot and cold supply and running them into a bucket or drain to check the pressure coming from after the shutoff valves. The problem could also be in the mixing valve and you'd need to remove and inspect the cartridge if it's there. basically anywhere after the two water lines merge could have a blockage. Not the answer you're looking for? Browse other questions tagged plumbing water-pressure kitchen-sink or ask your own question. Why does my kitchen faucet have low pressure after the water heater was replaced? What killed my kitchen faucet pressure? Why does only the hot water have low Water Pressure from my 2 handle kitchen faucet?